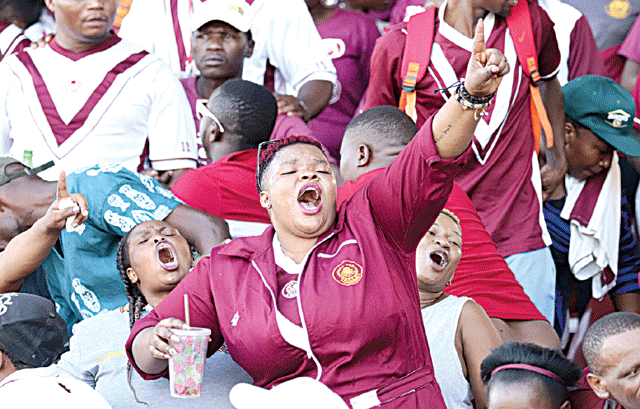 SOCCER – ‘SOLO INJE’, Premier League big guns Manzini Wanderers, Mbabane Swallows, Young Buffaloes and Green Mamba made it in the last 16 of the EswatiniBank Cup yesterday when it rained goals at Somhlolo National Stadium. The army side were the highest scorers in a 6-0 win against Shooting Stars as there were upsets during the triple header played at Somhlolo National Stadium. The opposition did not pose any threat and ‘Buffs had little trouble in dispatching minnows. This match went to break with Buffaloes leading 2 – 0 through goals scored by Wandile Mkhonta and Sanele Ngcamphalala. They upped the tempo in the second half where they scored four more goals as they reached the last eight with relative ease. It was an easy match for the defending champions even though Shooting Stars tried their best on the day. The second game saw Mbabane Swallows struggle to eventually win 4-1 against a very stubborn Masundwvini Royal Swallows. The minnows would trouble Swallows now and again as they defended resolutely and it was Swallows captain Tony ‘TT’ Tsabedze, who eventually broke the deadlock. ‘TT’s goal was a result of a great solo run as he dribbled past defenders before passing the ball to Sabelo ‘Sikhali’ Ndzinisa, who also made a deft touch, allowing the captain to score with ease. This match went to break with Swallows leading 1-0. Swallows continued to press in the second half and again it was ‘TT’, who this time scored with a beautiful header. Royal Swallows were not to despair as they also scored to make it 1-2 which proved to be a consolation, following a good interchange of passes. They continued to pile pressure in search of an equaliser but it was Swallows, who scored their third goal through substitute striker Lilopo. ‘TT’ proved to be the hero when he scored his team’s fourth goal completing his hat-trick after a beautiful strike that was written class all over it as the minnows were dumped out. The last match at Somhlolo saw Manzini Wanderers make light work of Midas City as they won 5-0. The ‘Weslians’ outclassed the National First Division outfit infront of the over 3 000 fans who watched the games. Their first goal was from the spot after their South African winger John Pako was brought down inside the box with former Mbabane City playmaker Mancoba ‘Spider’ Maseko giving Wanderers the lead. Two minutes later Ghanaian striker Johnson Mensah made it 2-0 with a sublime header with John Pako registering his name on the scorers chart with a low shot which deflected on the opposition’s defender in the 37th minute. Seasoned midfielder Sicelo ‘Junior’ Simelane ensured a healthy lead for the side before the breather as he netted the fourth goal shortly before the match went to recess. There was nothing much to write home about in the second stanza as the ‘Weslians’ had already done the damage with Njabulo Magongo netting the fifth goal with a clinical strike. Wanderers were without dribbling wizard Mike Dombo but were too strong for the NFD side. Elsewhere Green Mamba beat Zibonele Vultures 3-1.